The fifth in a series that once represented welcome freshness in the blockbuster formula, Pirates of the Caribbean: Dead Men Tell No Tales is only enjoyable insofar as it can occasionally remind you of how much more fun you had at the other ones. Gore Verbinski managed to revitalize the old pirate swashbuckler with 2003’s Curse of the Black Pearl, a perfectly structured adventure movie let loose with an endlessly charming cast and its director’s elaborate visual imagination – cursed seafarers turning into skeletons by moonlight, and funny visual gags involving sinking ships, subverting expectations, and Buster Keaton-ish choreography. Then there was, of course, the loopy, unpredictable mannerisms of the ditzy, tipsy, rascally scoundrel Jack Sparrow, played by Johnny Depp in the most wholly successfully enjoyable performance of his career, bringing in great eccentric surprise from the margins of every scene. The rest of the trilogy allowed Verbinski to go wilder with his terrific eye for spectacle, then a fourth – a coda for which the director and some of the main cast didn’t return – managed to eke out its charms by not spoiling the affection built up by its predecessors. This time around, though, what once felt like a new approach to an old subgenre is now waterlogged and predictable itself. Once again, we’re introduced to a band of ghost pirates intoning about curses and revenge. This time it’s a Spanish crew led by Javier Bardem (speaking incomprehensibly through a mouthful of black bile) who are undead, trapped on their zombie ship in a cave. They crave freedom to sail the seas and slay the pirate who left them for dead. Wouldn’t you know it? That pirate was Jack Sparrow. Depp slurs in, playing the once-fun character as the drunkest and loopiest he’s ever been. His timing is off, the mannerisms are twitchier, and the charm is mostly gone. Now he’s not flirty and sly; he’s leering and grotesque. Still, there are times when he stirs from his stupor long enough to pull off a fun bit of action, like a fantastic slice of dark comedy involving an intricately choreographed guillotine gone wrong. To assist in filling out an adventure plot around this decaying caricature is a new fresh-faced hero, a young chap we’re told is the child of the trilogy’s stars, Will Turner and Elizabeth Swann. (That Brenton Thwaites is a pretty man who looks like the exact midpoint between Orlando Bloom and Keira Knightley helps sell the parentage.) There’s also a young lady scientist accused of being a witch (Kaya Scodelario). They meet crossing paths in pursuit of Poseidon’s Trident, an ancient device that controls all sea curses or whatever. It’s always something. The new filmmakers at the helm are Norwegian directors Joachim Rønning and Espen Sandberg, whose Kon Tiki is just the sort of straight-down-the-middle foreign film that gets you a Hollywood job. With a blandly competent anonymous style, they steer the franchise through choppy waters – a screenplay that’s pulling apart at the seams, old performances rapidly diminishing their appeal, and a tangle of convoluted new mythos that labors under its nonsensical approach to continuity. The aesthetics merely recycle what’s worked before – crumbling undead, soggy ships, sharp period costume – mixing in a few new sights – ghost sharks, a jewel-encrusted island. The action alternates between big and memorably stupid (a sort of restaging and one-upping of Fast Five’s bank vault finale, but on horseback) and big and boring (gloopy CG waterfalls and incoherent swordplay). As for navigating the series’ tonal balance or managing tricky performances, that’s where the movie falls flat the most. It flows out as a procession of incidents involving vacant figures, played with an exaggerated insistence on forced frivolity. There’s simply no consistent emotional tug or easily comprehensible motivation pulling it along when the movie must remind us of the stakes in increasingly desperate explanations. It’s bad enough Jeff Nathanson’s screenplay is constantly repeating itself, introducing every bout of exposition at least three times and throwing the characters into each scrape – jail cells, double crosses, hidden islands, and so on – at least twice. But for the new leads to remain only vaguely attractive blanks filled in with the scantest motivation and the old characters to appear reduced to barely more than moving Colorforms of their former selves? That’s where the movie’s total lack of tension, chemistry, and energy really starts to drag. There’s little about the movie that follows naturally out of what came before it in its predecessors’ continuity, making this at this point a series dragged out only for the sake of profit and not for invention of even a meager sort. Even the nods to old MacGuffins are convoluted and forced. There are fleeting moments of fun spectacle, that familiar stirring score, and a few choice cameos. But that it has its passably diverting moments only makes the soggy slog around it more tediously disappointing. Exactly the sort of big, dumb, industrial-strength, R-rated action comedy primed for the chattering classes to claim superiority over, Seth Gordon’s Baywatch movie is so base, so low, and so sincere in its shameless tittering silliness and commitment to creaky formula that of course it’s a good time at the movies. It’s shot with phony glossiness, filled with hot bods in skimpy clothes, and ready to go for endless banter and gross-out tangents alike. (A lengthy sequence of revulsive body horror comedy in a morgue is the movie’s indefensible nadir.) But, although it’s uneven, it’s also largely a good time. It has the grinning comportment of a genial half-sleazy/half-silly goof, just far enough over the top you can see its makers winking as they nudge their borrowed concept – overzealous lifeguards interceding beyond their authority – in the ribs. We’re not talking full on Lord/Miller meta in a screenplay credited to a committee of six writers, but just a dusting of self-awareness to the pleasantly empty formula. Gordon fills the ensemble with a collection of aspiring lifeguards under the macho man benevolence of Dwayne Johnson’s master swim survivalist. He’s the best at what he does and, in typical The Rock movie fashion, is only held back by those who won’t let him fix everything himself. It’s how his AWOL rescue chopper pilot in San Andreas doesn’t read as completely despicable when he absconds with Coast Guard property, abandoning his post to save his own family. Here he’s whipping a callow Lachte-lite scandalous Olympic swimmer (preposterously ripped Zac Efron) into shape as his replacement, while the other lifeguards (runway ready Alexandra Daddario, Ilfenesh Hadera, and Kelly Rohrbach, and chubby sight gag Jon Bass) help out where they can. The whole thing could be dripping in leering objectification, a la the original slow-mo bounce. But despite plenty of ogling, it’s all good-natured and balanced between the genders: heaving cleavage and rippling pecs alike, and suits hugging every sculpted tuchus tightly. There’s something refreshingly harmless about its equal opportunity eye-candy frivolity. A generic drug-smuggling action plot airlifted right out of the 1980s passes for story – Priyanka Chopra’s kingpin (or should I say “queenpin?”) is a stylish, affable villainous presence – but for all the fireworks that conflict sets off – and satisfyingly so, with action beats pleasantly brisk – it’s the loose hangout vibe of the picture that makes it work more often than not. In its likeably slumming stars, splashy shiny half-faked beachfront cinematography, and sandy shaggy digressions (including some half-painful cameos from the original series), the whole endeavor is so agreeably low. Although I still wonder if Gordon (having made the likes of Four Christmases and Horrible Bosses, decent for middling affairs) will ever make a fictional comedy as good as his 2007 doc The King of Kong: A Fistful of Quarters (still the funniest work of his career), this big-screen junk-TV revival is his best attempt yet. The dictates of blockbuster franchising have taken Alien, Ridley Scott’s 1979 masterpiece of a claustrophobic spaceship creature feature, and expanded its grim point of view. Each iteration sends a crew of humans into space never to return, devoured inevitably by the memorable, acid-dripping, body horror-manifesting, otherworldly beasties. Through sheer repetition and accumulation of incident, this is now a rigorously cold and isolating perspective for a popular film series. It says humans are capable of great things – space travel and sci-fi tech and all that stuff – but that we will invariably mess it up. We’re doomed, essentially. Our species will bump up against our cognitive and sociological limitations to die alone in the cold emptiness of outer space. Fitting that the franchise which began with the tagline “In space, no one can hear you scream,” has only made the sentiment darker, sadder, and more disturbing. After largely enjoyable sequels helmed by a rotating director’s chair of popcorn auteurs (James Cameron, David Fincher, Jean-Pierre Jeunet, Paul W.S. 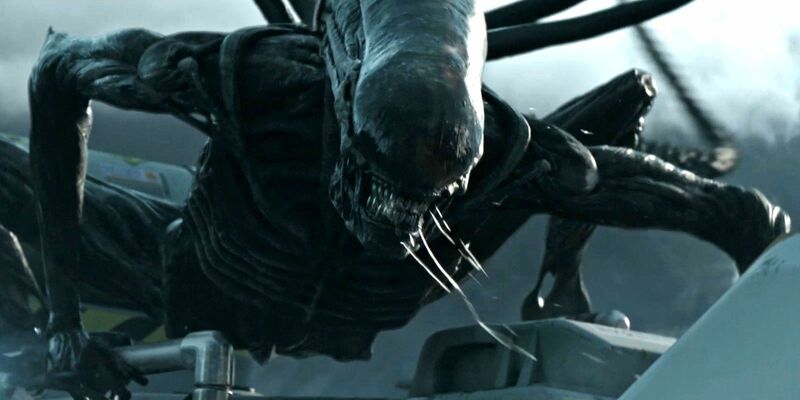 Anderson), Scott took control once more with the 2012 prequel Prometheus. That brilliantly austere film asked big philosophical questions about creation and existence in cold frames and cool designs while still managing a pulpy monster movie sending an all-star cast to their memorable dooms. A direct sequel to the prequel, Alien: Covenant doesn’t manage the balance quite as well, but Scott is a consummate craftsman, able to navigate complex sequences and ambitious design for an intelligently crafted picture. It may just be another Hollywood spectacle riffing on images from once original concepts long since passed into brand deposits. But would that all such productions be made with such considered design and calculated awe. Here is a movie made by filmmakers at the height of their powers, executed with tension and dread, heightened by a sense of the eerie and sublime. At one point, it packs a mind-bending epic into a short, evocative flashback – images of spinning spaceships raining Black Death on an old future world – wrapped in 19th century poetry intoned by an inscrutably villainous android. Talk about handsome pulp. The film follows a predictable pattern, first introducing a large crew on a colonization mission to a distant planet. Something goes wrong mid-flight and they awake to hear a distress call slightly off their course. They check it out, and are immediately imperiled by mysterious creatures who latch on to their anatomies and don’t let go – not just the series’ famous facehuggers, but spores that bore into nostrils and ear drums, and embryonic aliens birthed by splitting men in two with geysers of gore. The screenplay by John Logan and Dante Harper does not ask much of its famous faces, but the welcome likes of Katherine Waterston, Billy Crudup, Danny McBride, Demian Bichir, Jussie Smollett, Carmen Ejogo, and Amy Seimetz go a long way to selling the weary professionalism and increasingly frazzled nature of deep space dilemmas slowly morphing into all-out survivalist horror. Best is Michael Fassbender as the crew’s android Walter, a kindly protective useful thing, and David, the older model abandoned on a dead world with a human survivor (Noomi Rapace) after the events of the previous film. He’s now becoming something of a mad scientist with an ego to match. The dual role plays between a new, perfectly manicured robot built to serve and an old robot who has unsettlingly developed eccentricities and long shaggy hair. Any movie that can stop dead in its tracks for twin androids to practice playing the recorder and maintain the film’s core creepiness is alright in my book. Scott designs the movie with a tension between the wild sci-fi scope of his gods’ and monsters, intelligent design, dark, space epic and the tiny, drooling, chamber piece horror as the characters are confronted with the terror of the unknown. We see in the robots and spaceships – and the long, loving, detailed effects shots of the technology in action – hints of Kubrick’s 2001 and Scott’s own Blade Runner, but he’s mostly riffing on his own franchise at this point, feeding plots and images back into the ouroboric endeavor of big-screen mythmaking. We’ve been here before, but never exactly like this. It has humans capable of traveling into the unknown only to be brought down by their own hubris, caught between forces beyond their control – nature – and those which they begat – technology. The universe doesn’t care. Either way, they’ll die. It’s the exact opposite of his last feature, The Martian, which said all outer space problems can be solved through science, teamwork, and determination. Here he’s ensured his flagship franchise is an entertaining and deeply pessimistic one, encompassing killer robots, drooling monsters, ancient aliens, and intergalactic genocide. The deliberate one-by-one slasher pace set against the backdrop of vast mysterious vistas and beguiling futurist detail this time finds its cast a mere facet of the production design, a routine but ponderous formula that works well enough again.